VW New Beetle 6 CD Changer. Good used condition. Faster postage available. Removed from 2005 vw golf mk5 gti 6 disc cd changer to be fitted in to armrest Good working condition Many other vw audi parts available please contact us!! GOLF MK5 MK6 SONY. 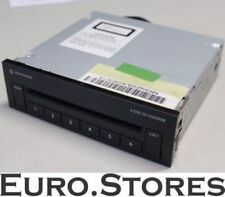 YOU ARE BUYING GENUINE VOLKSWAGEN EXTERNAL 6 DISC CD CHANGER. 6 DISC CD CHANGER. REMOVED FROM VOLKSWAGEN GOLF GTI. MADE BY SONY FOR THE CENTRE CONSOLE ARMREST BETWEEN THE TWO. PLUG CONNECTION ON THE BACK A 10 PIN. Genuine factory fitted armrest with cd changer removed from a mk5 golf gt tdi. 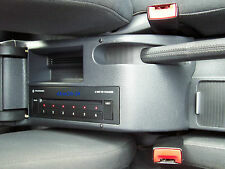 GENUINE VOLKSWAGEN 6 DISC GLOVEBOX MOUNTED CD CHANGER. PASSAT B6 2006-11 MODEL YEARS (3C). Upgrade for the Volkswagen sound system. For horizontal installation in the glove box. Holographic 3-beam scanner. GOLF MK5 2004-09 MODEL YEARS (1K). GOLF ESTATE MK5 2007-09 MODEL YEARS (1K). BEETLE 1999-10 MODEL YEARS (1C). BEETLE CABRIOLET 2003-10 MODEL YEARS (1Y). CENTRE CONSOLE VERTICAL FITTING LOCATION. JETTA 2006-10 MODEL YEARS (1K). Donor Car: 2000 VW Golf MK4 2000cc Sport. The New and Used VW Parts Specialist for all VW models worldwide. VW Part Number: Unknown. Donor Car Colour: Bodywork is Black L041. Interior trim is Black RD. 6 DISK MULTICHANGER. 1.8 PETROL. T5 Transporter / Caravelle 2003 - 2007 . Passat B5 1998 - 2005 (with double din fascia in dashboard - this was standard on cars from 2001). This is a new, genuine part. Part number. Alternative part numbers. Works with the following decks for example on Polo, Golf, Lupo, Bora, etc Genuine VW indash 6 CD changer for adding to Beta and Gamma tape deck stereos. Used but fully tested in good, clean working order. I believe this will also fit a MK2 Ford Mondeo but you will probably need a different mounting bracket. Fully working with security code - head unit is a cassette player not single CD player. Also, be aware head unit although similar to other Ford models will only properly fit a Galaxy as the external corners are not rounded. Passat B7 2011 - 2015 . This is a wiring loom set that connects the CD changer or iPod / USB in the armrest for the following cars Passat B6 2006 - 2011 . Passat CC 2009 - 2012 . This is a new,genuine VW part. Genuine VW Polo 6n2 CD changer and bracket. Unit may also fit Mk4 Golf however the bracket may be different. REMOVED FROM VW PHAETON 3.0 DIESEL AUTO 2008. IN GOOD USED CONDITION. ANY BIG ISSUES WILL BE CAPTURED AND SHOWN IN PICTURES. (Taken from: 2007 VW GOLF MK5 1.9 TDI BXE, BLACK LC9Z, GEARBOX JCR, 5 DOOR, BREAKING) 1C. YOU WILL FIND MORE INFORMATION ABOVE. Used Condition! Have minor mark, dents, slights scratch. VW Transporter T5 - 6xCD Changer & Under Seat Mounting Bracket Cradle. Condition is Used. In good working order. Tested. Dispatched with Royal Mail 1st Class. Usually sent out within 2 working days. Sent recorded and tracked. This was removed from my dad's car. It is an original aura radio cassette and cd changer in very good condition. All in perfect working order when removed. 6 disc cd charnel with cassette and facia surround included. No cables (ISO cable for connection) The radio code is included Collection from Glasgow or sent via courier. Payment is cash on collection or PayPal only. We are always happy to assist you in any way we can. GENUINE VW VAG COMPACT DISC MAGAZINE 6 SLOT. ANY ELECTRICAL ITEM(S) THAT MAY NEED TO BE CODED/MATCHED UP BEFORE WORKING. We take great care to make sure you receive the item as described and in the described condition. ITEM QUANTITY. In good condition stereo has some wear on buttons it is visible in the photo. CD changed has no scratches, damage or wear. VW Golf MK4 Bora Passat Polo 6Disc Boot CD Changer Cartridge & Bracket Part number :- 1J6035111. Condition is Used. Dispatched with Royal Mail 1st Class. Genuine Parts & Accessories with Genuine savings! Part Number: 2E0057158K. AUDI TT MK1 6 CD MULTI CHANGER INC BRACKETS & CARTRIDGE & CABLES RETRO FIT KIT- EVERYTHING YOU NEED TO INSTALL. Condition is EXCELLENT and fully tested prior to removal. Dispatched with Royal Mail 1st Class. Generation: MIB2 GP, 2017. Ask us for a retrofit Kit with DAB antenna. CD, 2x SD CARD READER, BLUETOOTH, DAB , WI-FI. Digital radio: DAB (areal needed). VW PART NUMBER. Bluetooth Handsfree: Yes. 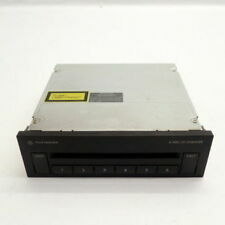 6 CD changer [minus CD cassette], suitable for 1998-2002 Jetta/Passat/Golf. Removed from a previous vehicle, VW part, made by Panasonic/Matsushita. Condition is excellent. Originallyo ut o f a Fo rd Mond eo. WIGAN AUTO SALVAGE LTD. SECURITY MARKS. No code. No international bidders please. Thanks for looking! The New and Used VW Parts Specialist for all VW models worldwide. VW Part Number: |Unknown. Donor Car: 2006 VW Passat B6 Saloon 2000cc. Donor Car Colour: Bodywork is Blue LD5Q. Interior trim is Black WN. The New and Used VW Parts Specialist for all VW models worldwide. Donor Car: 2003 Volkswagen Passat Saloon 1900cc. VW Part Number: 1J0 035 186 D. Donor Car Colour: Bodywork is Blue LC5X Inky Blue Pearl. Part no: 3D0035110. reference: C31. VW Passat MK4 B5 / B5.5 2004. Radio Stereo Tape Deck Player. I only know that the item will fit the pictured car. The VW Genuine car radio RCD 4002 2-DIN with CD drive is mp3 capable and is fitted with an internal Bluetooth hands-free system as well as an internal CD changer. It is also easy to retrofit into a vehicle. Genuine VW / V.A.G. part. Label has faded so part # unreadable. Looks like a '90s or early '00 part. Donor Car: 2005 VW Golf GT MK5 2000cc. The New and Used VW Parts Specialist for all VW models worldwide. VW Part Number: Unknown. Donor Car Colour: Bodywork is Black L041. Interior trim is Black KG. Matsushita CX-DV1070L. - CD Changer Compatable. VW Golf MKIV. Refurbished CD Player. Our staff have been Manufacturer Trained and Certified in Service and Repair techniques. In this instance we would suggest that you consult your Volkswagen Main Dealer for further advice regarding compatability. 2004 VW PASSAT 1.9 TDI 5DR 6 DISC CD CHANGER. 1J6035111' - 6-disc cd changer. VW Touareg 2003 —2010. Removed from a 2008 VW Touareg. Otherwise in good used condition and perfect working order. VW Passat syncro 1997–999. VW Golf/Variant/4Motion 1998–2006. Model - NEW BEETLE. Year of Manufacture - 2006. The New and Used VW Parts Specialist for all VW models worldwide. VW Part Number: 1K0 035 186 R. Donor Car: 2006 VW Passat B6 Saloon 2000cc. Donor Car Colour: Bodywork is Blue LD5Q. Interior trim is Black WN.